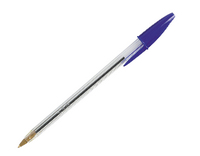 Bic Cristal Ball Pen. Lightweight, clear, hexagonal barrel provides comfortable and controlled writing and the durable tungsten carbide ball ensures consistent skip and blob free writing. Medium Point - line width 0.4mm. Ink Colour: Blue. Approx Dimensions (CM): D16.4 W14.5 H7. Approx Weight (KG):0.5761.